Then, a lightbulb went off in my head…why was I putting the silkworm castings in the vegetable garden when I could oh so easily put them in the indigo patch where they would up the nitrogen level thereby producing more blue naturally? 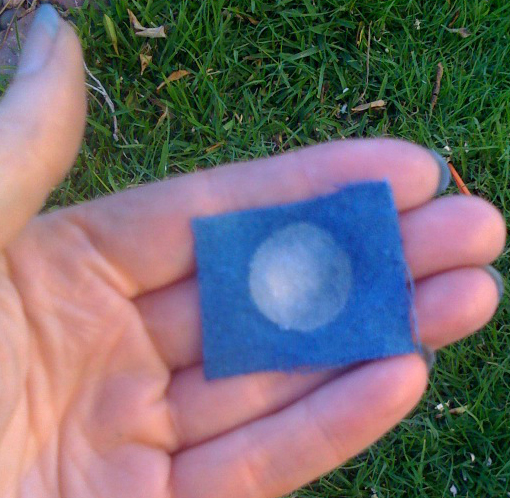 A perfect indigo silk circle. Yesterday there was some fun interaction on the FB studio page regarding frass where I came to discover May Berenbaum…I’d love to meet her someday. Here, she writes about frass. and here is an interesting podcast interview she did with scientific american. And for a little Sayonara Sale…typically in Japan, when one moves, one has a sayonara sale. That’s just the way they do it there. Also, a sayonara sale is a great place to pick up stuff you need when furnishing a new apartment. Check out the sayonara sale ads in the Tokyo craigslist. Garage sale- Japanese style. 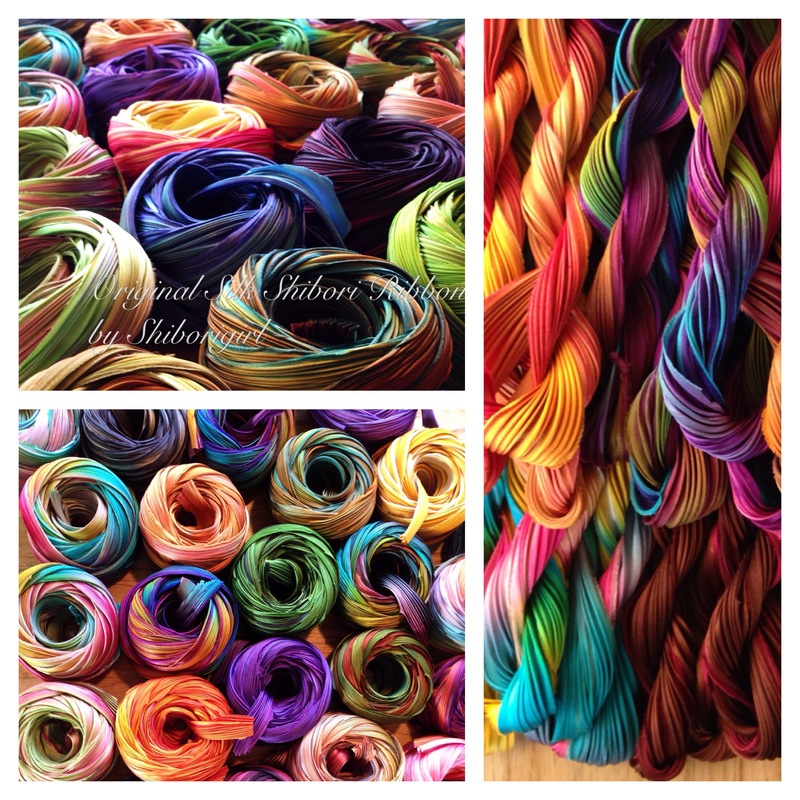 -packs of 6 one yard cuts of six different colors of pleated silk shibori ribbon. Dyer’s choice as far as the colors go but what color wouldn’t you want? Sayonara sale through Friday night only with the last order to ship Saturday. 6 yards for $60- in the shop now. ~and speaking of perfect circles…jude is gathering stones. This entry was posted in shibori and tagged frass, indigo, may berenbaum, processing indigo, sayonara sale, sericulture, silk shibori ribbon, silkworms, spiritcloth on May 16, 2012 by shiborigirl. each indigo boro fabric pack will have some to stitch with! is always watching me…it’s been a busy week! and if you were wondering, the indigo shibori timpani mutes worked perfectly! a good performance, reportedly. next week i will see for myself- a quick trip to hear some music performed. (and all the ribbon scrap bags are gone for now…but the boro packs and subscription videos are still available if you are in jude’s cloth to cloth class and have ordered a pack they are on the way to you within a day or so of ordering them…enjoy! i understand some great things are going on there!) and a new subscription video series is forming here…don’t think i want to miss this! This entry was posted in dyeing, houston quilt festival, indigo, shibori, silk and tagged boro, cloth to cloth, indigo, jude, shiborigirl, spiritcloth on October 10, 2010 by shiborigirl. back in the spring i planted these glorious sunflowers and they have been blooming profusely next to my outdoor workspace for the past month. much to my surprise i had unintentionally placed them right where they would grow up and be viewed from the inside- out the window over my kitchen sink. i have been enjoying them so much. everyday they are right next to me as i work at the indigo vat and as i dye and steam colored silks and in the morning when i make a cup of coffee or do the dishes i see them from inside the kitchen. i recently dyed up some silk organza for flower work and as i often do, i just let my imagination run with the moment as i poured dye over the fabric. without intention really, just letting intuition and the moment lead me on. so i guess it was no real surprise that one of the colors ended up mimicking the colors of the flowers i see everyday. but still, somehow i was surprised. maybe it is related to what Jude is doing here. more about listening to your own voice and less about “trends” and other such things. This entry was posted in arashi shibori, dyeing, experimenting, flowers and tagged spiritcloth on August 4, 2010 by shiborigirl. the female moths are busy laying eggs now and i am busy preparing things for my booth at the upcoming Long Beach Quilt Festival. my booth is my nest of sorts for the duration of the show and i like to see it properly feathered. jude’s spirit will be with us as well. she is sending this and a few other things for proper feathering. also new in the *indigo department* will be a selection of what i am calling Whole Cloth. larger pieces of indigo fabrics including my sea and sky fabrics as well as shibori indigo. due to the time required to make these, they are somewhat limited. they include cottons, silks, hemp, linen, wool and other interesting fabrics. i will be posting up more pics as i can but most of my time over the next week is devoted to nest making. This entry was posted in arashi shibori, buy shibori, contemporary shibori, dyeing, indigo, itajime, japanese textiles, long beach art, long beach quilt festival, makiage, quilting, sericulture, shibori, shibori ribbon, silk, silk study tour, silkworms and tagged spiritcloth on July 14, 2010 by shiborigirl.